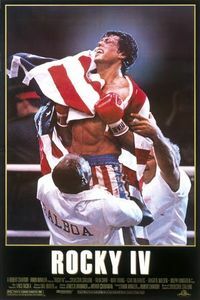 Rocky IV is the fourth and most successful movie, in terms of box office gross, of the Rocky franchise. Rocky Balboa (played again by Sylvester Stallone), has said he plans to retire from boxing after recovering his title from Clubber Lang in Rocky III. A new sensation from the Soviet Union, Ivan Drago (played by Dolph Lundgren), however, begins to emerge as a top contender. Following his win over Clubber Lang, Rocky retires to spend time with his family. When Ivan Drago (Lundgren), an intimidating, huge, Soviet boxer arrives in America to challenge the best American fighters. Apollo Creed, motivated by patriotism and a desire to prove himself after retirement, quickly jumps at the chance to step back into the ring in an exhibition bout against Drago. Despite apprehension from Rocky, who eventually agrees to help train him, Apollo sets the match between himself and Drago in Las Vegas. With Rocky in his corner, Apollo flamboyantly makes his way to the ring with a bigger show than when he first fought Rocky, which includes fireworks, a concert by James Brown, and a patriotic theme, including a crowd implacably hostile to the visiting Soviet boxer. The match turns into a tragedy, however, as Creed, after several blows is killed in the second round, after Creed, implored by Rocky, refuses to stop the match. Feeling grief over not stopping the fight, and incensed by Drago's cold indifference to killing Apollo, "If he dies, he dies", Rocky decides he must avenge Apollo's death and sets a match with the Russian. The match is set for December 25, in Moscow, because the boxing commission refuses to sanction the fight. Adrian initially cannot understand why Rocky would fight, fearing for his life. Rocky flies to a remote and rustic part of the Soviet Union to train; to help with his training he brings Apollo's former trainer Tony Duke and his brother-in-law Paulie. Training runs for several months, with Rocky using more humble methods like chopping wood, running up snowy embankments, and lifting huge rocks; Drago is using the most modern equipment coupled with regular injections of anabolic steroids. During one of his runs, Rocky returns to find Adrian waiting for him. With Adrian providing more reason to succeed, Rocky begins to train even harder. After intense preparation for both fighters, the two men finally meet in the ring. The match set in Moscow, before the Politburo, and is broadcast throughout the globe. The crowd is strongly against Rocky, booing him fiercely and cheering Drago, as the American crowd cheered Creed and booed Drago in Las Vegas. After a pummeling first round, with the Russian easily winning, Rocky comes back toward the end of the second and cuts Drago just below his eye. With Drago's confidence shaken by the injury and Rocky's apparently limitless endurance and resilience, the fight degenerates into a brutal battle of stamina and will across all fifteen rounds. By the end, the Soviet crowd has been won over by Rocky's determination and endurance, and have begun chanting his name. In the fifteenth and final round, both fighters batter at each other, but Drago's endurance finally runs out, while Rocky finds his last burst of strength and lands one final signature left hook that finally knocks out the Russian. Following his victory, Rocky gives an impassioned speech to the crowd, acknowledging their initial and mutual disdain for each other, and how they've come to respect and admire each other during the fight. Saying that the brutal battle between him and Drago in the ring was better than war between their two countries, he brings the crowd, including the Politburo, to its feet in applause, by claiming that "if I can change and you can change, then everybody can change!" After the fight, Rocky delivers a dramatic anti-Cold War message talking about union and friendship between both countries, as Andrew Korn's Russian character cheers. Because of his message in this sequel of Rocky and his characterization of an American military hero in Rambo: First Blood Part II in that same year, Stallone earned an award from President Ronald Reagan that year.